The Barnstormers kept the fans on their feet last week in the nail-biting victory over the Spokane Shock. First on the board, the Stormers’ wide receiver, Jesse Schmidt caught a 15 yard pass from quarterback Brad Banks to get things rolling. However the Stormers’ kicker, Pitor Czech, struggled to make his PATs, missing all 3 attempts in the first half and allowing the Shock to slide into the lead at half time 28-18. Coming out in the second half the excited fans were not giving up hope on their Barnstormers. Iowa once again was the first to score with another Banks’ completion to wide receiver Todd Blythe for a 16 yard touchdown. Two more touchdowns thrown by Banks put the Barnstormers on top (37-35) with 3:38 to play in the third quarter. The final twelve minutes of the game seemed to go by very slowly for Stormer fans with the score sitting at 43-42 Iowa. Fans were getting antsy as the strong Spokane defense prevented the Barnstormers from scoring off the 2 yard line with 1:05 still to play. The Shock began their drive down the field but the quick reflexes of DB Camero McGlenn lead to a Barnstormer interception with 0:50 on the clock, sealing the deal for the Barnstormer’s first 2011 victory on their home turf. The San Jose SaberCats (2-1) struggled last week against the top seat of the National Conference-Central Division, the Chicago Rush (3-0). After a strong first quarter, the SaberCats lead 8-6 but were unable to maintain that lead throughout the rest of the game. The Rush dominated in the second half, eventually walking away with the victory 54-41. Iowa Barnstormers @ San Jose SaberCats will be broadcast LIVE on 1700 AM The Champ, on the Internet at www.theiowabarnstormers.com and at www.nifty-tv.com. -This is the seventh meeting between the San Jose SaberCats and the Iowa Barnstormers in their franchises’ history. The series is tied 3-3. The Iowa Barnstormers (1-1) and the San Jose SaberCats (2-1) will go head to head this week in the Golden State. Currently ranked 2nd in the National Conference-West Division as well as being ranked 2nd in passing and 4th in rushing in the AFL, the SaberCats will bring a strong quarterback/receiver combination to the field. 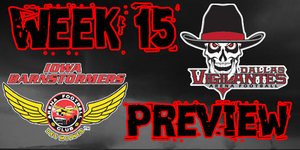 The Barnstormers will look to carry over the intensity from last week’s game into Friday’s match up and extend their winning streak to 2 for the 2011 season. Brad Banks exemplified his leadership skills on the field last Friday, guiding the Barnstormers to their first win of the 2011 season. Banks threw three touchdown passes in the third quarter to put the Stormers’ in the lead, 37-35. He rushed for 44 yards, including 2 touchdowns and completed 20 of 32 passes for a total of 232 yards.